110+ hours of professional tap dance training, coaching and practice in 21 days. Die 3-wöchige Steptanz Ausbildung richtet sich an ambitionierte Amateure und Semi Profis, an Performer und Tanzpädagogen, die ihre Fähigkeiten und Kenntnisse im Steptanz vertiefen und professionalisieren möchten. Alle Steptänzer ab einem Level von Intermediate Advanced sind herzlich eingeladen an diesem Training teilzunehmen. Das intensive Training vermittelt umfassendes und professionelles Knowhow im Tap Dance, mit Schwerpunkt auf Technik, künstlerische Ausdrucksweise, Musikalität und Unterrichtstätigkeit. Der komplette Kurs geht über 3 Wochen und beinhaltet ca 110+ Stunden an Unterricht, Übungsstunden, Training und Coaching. The 3-week tap dance training is aimed at ambitious amateurs and semi-professionals, performers and dance teachers who want to deepen and professionalise their skills and knowledge in tap dancing. All tap dancers from a level of intermediate advanced are invited to participate in this training. The intensive training imparts comprehensive and professional know-how in tap dancing, with a focus on technique, artistic expression, musicality and teaching activities. The participants receive daily group lessons in the various content of the classes and are also accompanied individually in one-to-one coaching sessions. The complete course lasts 3 weeks and includes approx. 110+ hours of instruction, practice, training and coaching. The Pro Tap Training has not only given me the opportunity to improve my technical and dance skills, but it has also fundamentally changed the way I see myself as a dancer, a musician, an artist. I also pass this inspiration on to my students! Participating was the best decision I have ever made. Die 3-wöchige Training & Coaching kosten € 1800.- pro Teilnehmer. Die Teilnehmerzahl ist auf 15 Personen begrenzt. This training program is aimed at tap dancers from Intermediate Advanced Level. Professionals are as welcome as amateurs who want to professionalize their tap dancing. It is equally suitable for prospective dance teachers and performers and combines artistic and pedagogical aspects. The costs for the 3 week professional training is € 1800.- per person. Places are limited to 15 students. We are dancers from Moscow, we dance swing dance and tap for about 5-6 years. 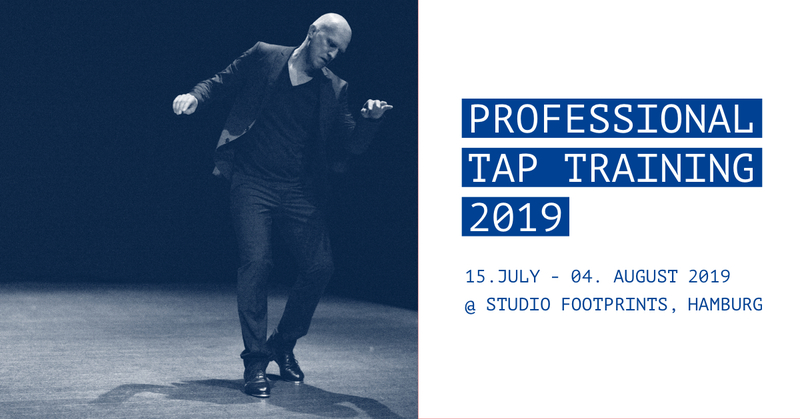 In August 2018 we participated in the one month Pro Tap Training Program from Thomas Marek and his team. It was a fantastic experience, one of the best in our live! Almost every day we went to Studio Footprints to work on our dancing and understanding the art of Tap Dance. Every day Thomas opened our eyes on a new topic of dance, music, technique and history. Our understanding and feeling about dance constantly changed and improved. work to become an artist in the future if you have enough dedication. The whole program gave us a very big boost in our development as dancers and our understanding of what you need to have as an artist! We learned how to work by ourselves to have maximum efficiency! The program gave us the opportunity to work with musicians and it was the first time we danced together with live music! When we came back to Moscow we found musicians we can work with and joined them as tap dancers for their jam sessions. During the program we worked a lot on improvisation. Before it was always very stressful for us to improvise but after our training it became very natural. We started to work on improvisation regularly and now have real fun with it! We realized how important it is work on your own dancing and creativity. During this program we created our first choreographies, and now we do it regularly. We began to listen to music more carefully, and our dancing became more connected to music. We also learned how important movement is in tap dance, and how it can affect your sounds and rhythms. We always wanted to swing when we dance and here, for the first time got a real feeling for it. We learned to control our touch to the floor more and this affected our sound dramatically. We became more relaxed in our legs and now we can dance to much faster music then before. We teach tap dance in Moscow and now we use and spread a lot of the ideas from this program in our own classes. Our students are now more relaxed and also started to improvise without fear and with joy. This program is what you really need if you want to develop as an artist, have more quality in your dancing, if you want to talk with your feet, if you want to have good technique and improvise easily!